Maybe you got a tax refund, or maybe you have some cash lying around. Either way, The Financial Times has suggestions for relatively easy home projects that could make your life easier – and maybe even boost your home’s value if you want to sell. Although costs can vary widely depending on where you live and the materials you choose, the average cost of these improvements ranges from $1,300 to $5,000. Generator. Losing your power in the middle of a summer storm or a winter blizzard can be dangerous as well as uncomfortable. If you live somewhere where this happens more often than you would like, consider putting in a home generator. New kitchen counters. Replacing your old counters with granite, quartz or some other modern material can spruce up your kitchen and make it a more pleasant, updated space. Organize your closet. Adding a closet organizing system can maximize your closet space. That can make it a lot easier to find the clothes you are looking for -- and to close the door to your closet. Paint your home’s exterior. This brightens up the curb appeal of your home, whether you are selling or not. It also can help preserve your home’s exterior. Update your home technology by adding a system that allows you to control your house – from the air conditioning to the garage door to the alarm system – from your smartphone or other device. Put in a sprinkler system. No more moving the sprinklers around your lawn or worrying about watering while you are on vacation. Choose a system that can be run by wi-fi. Add a patio. 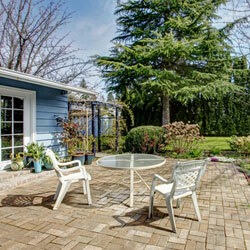 Patios usually are less expensive than decks, and they offer the same ability to enjoy your outdoor space. If you have the money, consider adding an outdoor fireplace. Spruce up your tub. Redoing your entire bathroom can get pricey. But adding a tub liner to your existing tub can make a big difference for a relatively small price. Hire cleaning help. If you are having trouble keeping up with your housecleaning, it can be a big help to outsource the job. You can hire someone on a regular basis or spring for a major cleanup every season or so.